Fall is the prettiest time of year, especially if you are in a color-changing state like we are in Michigan! 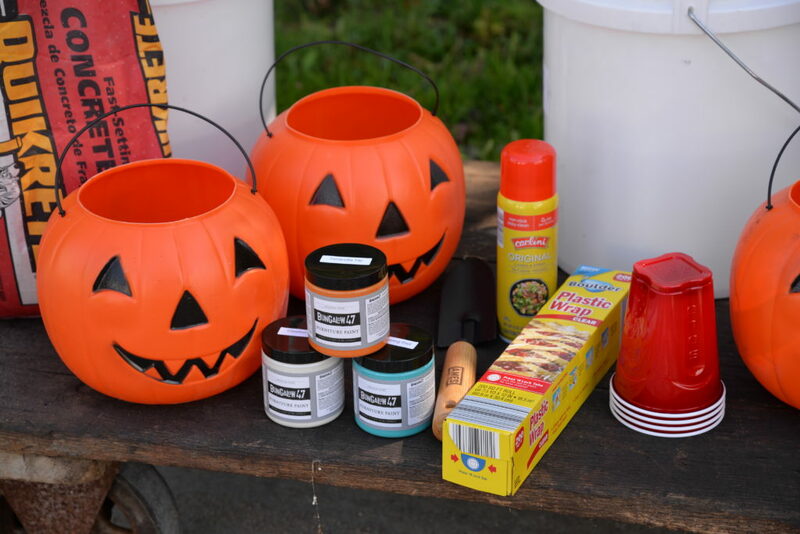 The days grow shorter, nights get an edge of a chill, and our crafting bug calls out to us to start projects! 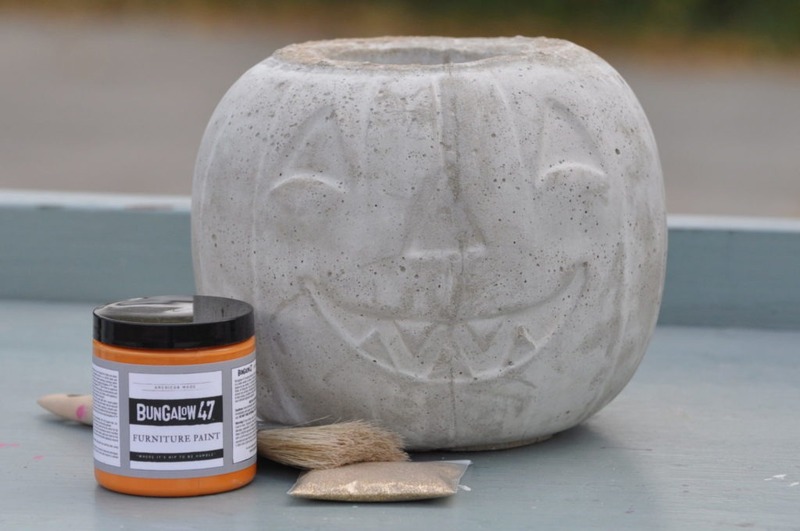 This week, we ventured out to make cement pumpkins. Bungalow 47™ Furniture Paint in a variety of colors. 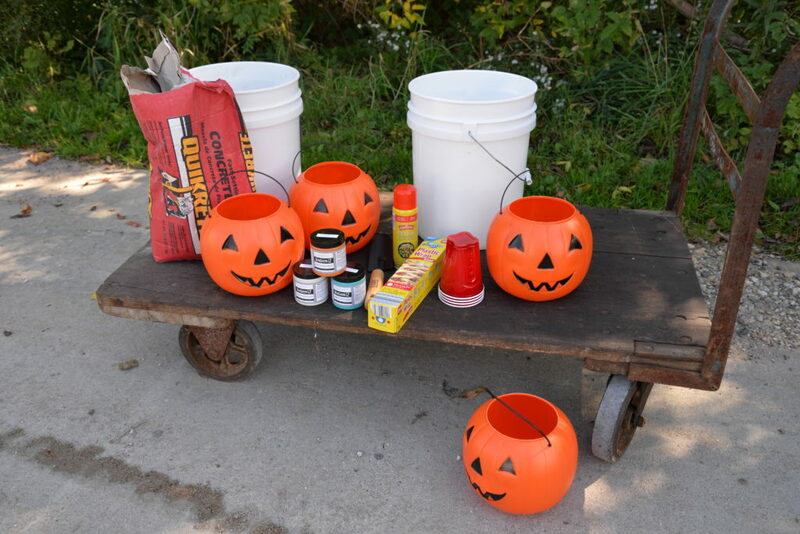 Not shown but needed: a large brick, sanding block, and a utility knife. 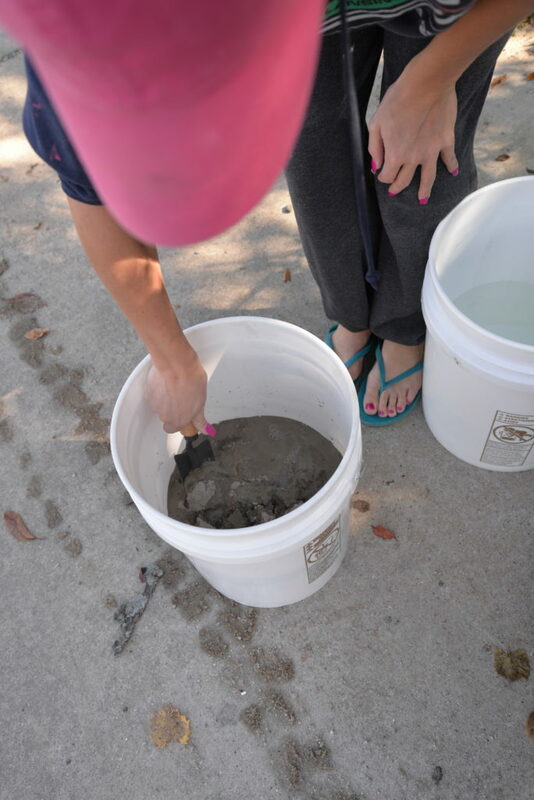 We began by mixing the cement according to instructions on the bag. Texture was key—not too runny! 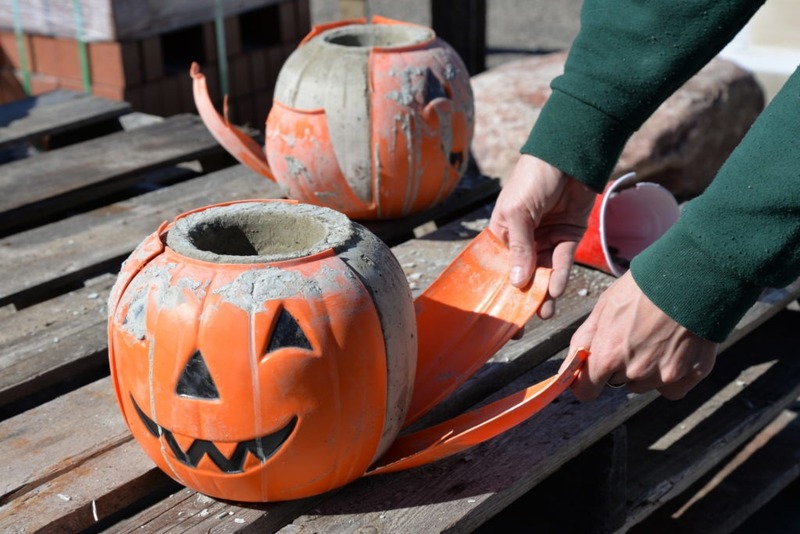 Next, we sprayed the inside of the plastic pumpkins, so the cement would not stick to the surface. Watch for thorough coverage! 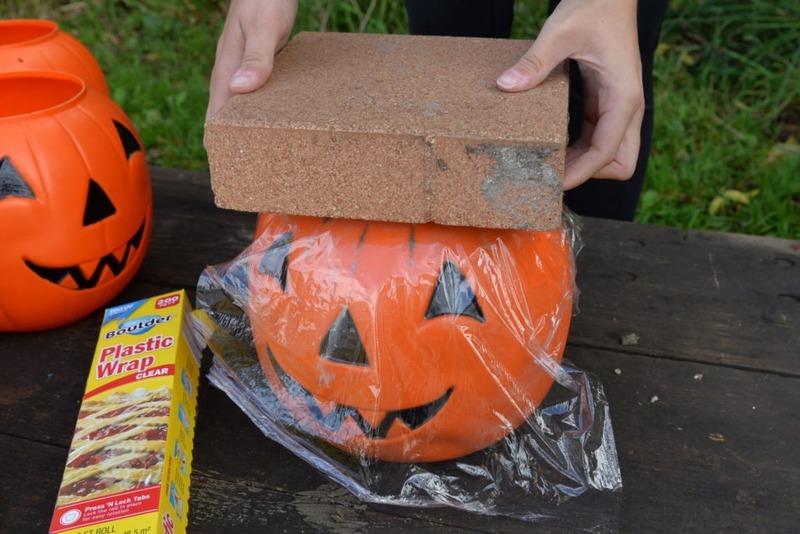 We then packed the cement into the pumpkin, smacking it down onto a heavy surface every now and then to minimize air pockets and make sure the cement was settling evenly. This is an important step, so don’t forget! We left a little room at the top, as we would be adding the solo cup to form a center vase shape. 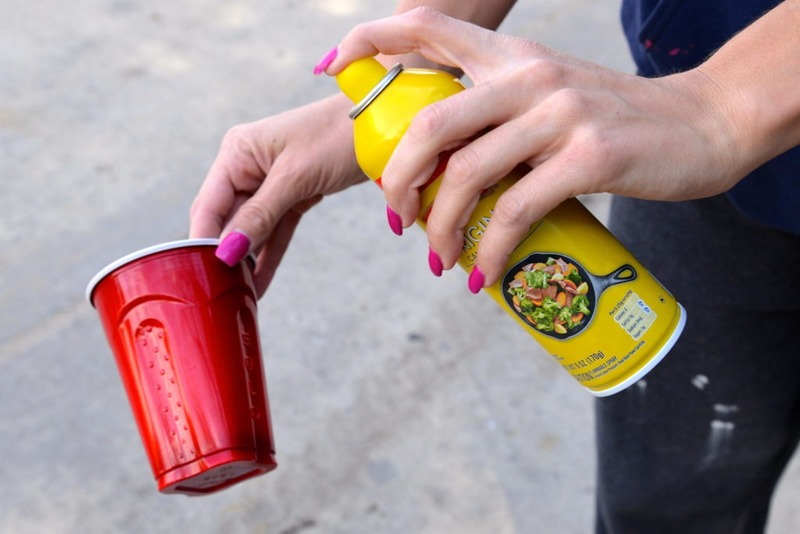 The solo cup got sprayed, too. No sticking here! 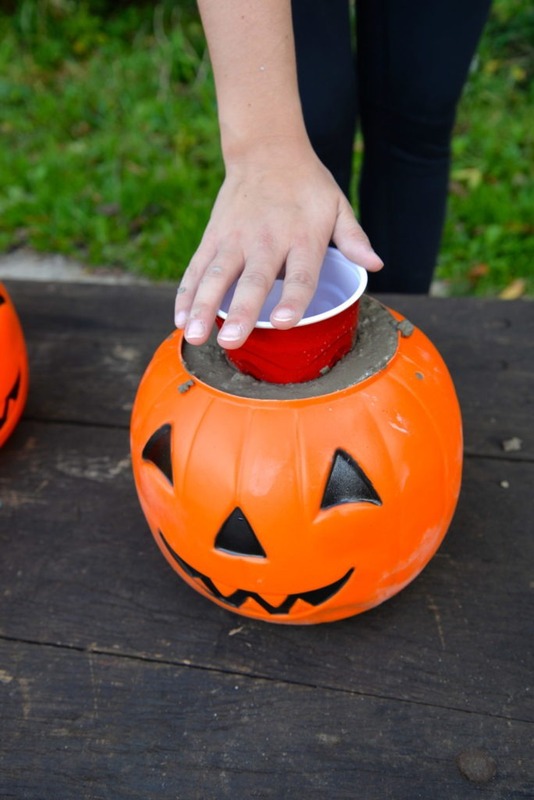 Next, insert the cup into the center of the cement. Push firmly down all the way. 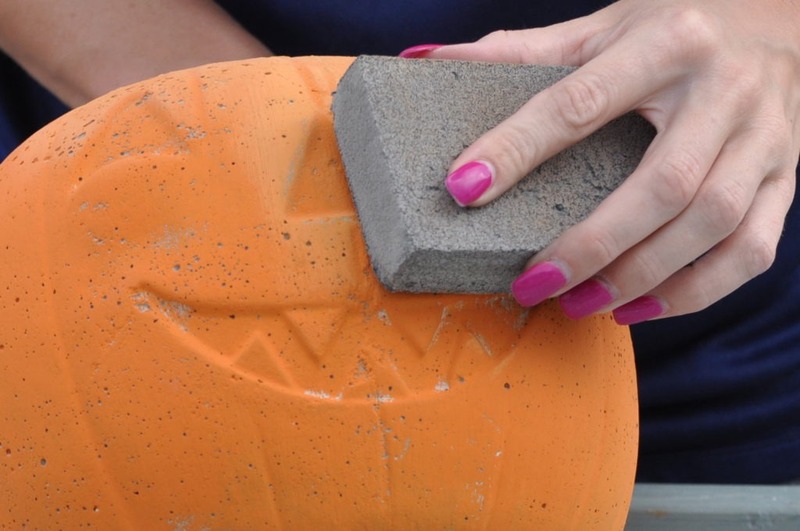 Wipe away any concrete overspill. 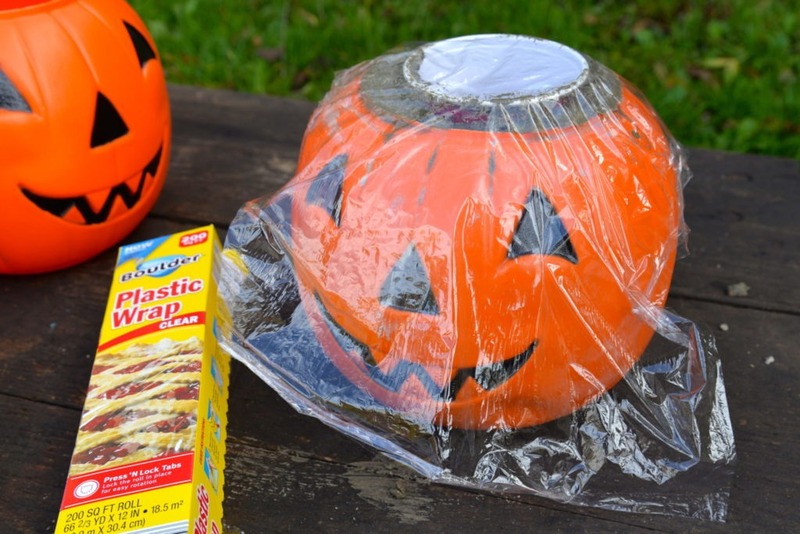 Cover with plastic wrap so you can place something heavy on it (this way the cup will stay in place). 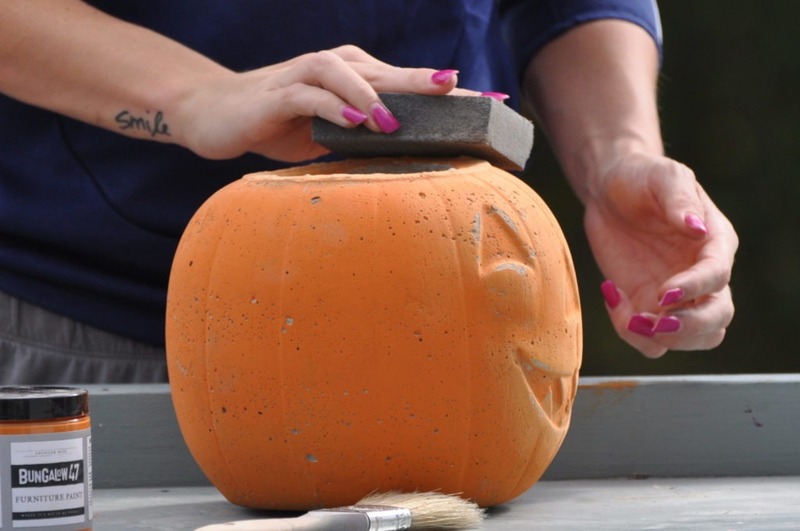 If you don’t do this, whatever you put on it to weigh it down will stick to the concrete. We used a large brick that was quickly available. Just choose something heavy enough to do the job. Allow to dry for several hours or overnight. Now for the reveal! Slice the plastic with a utility knife like an artichoke and peel back. 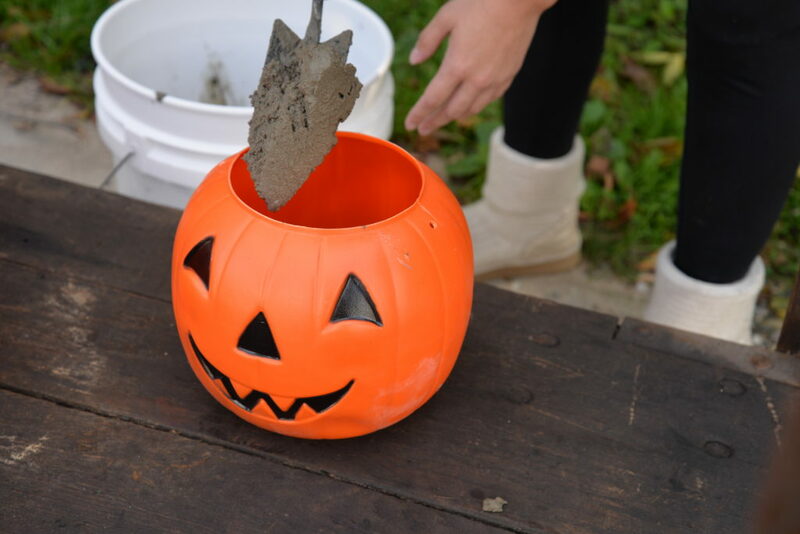 Be careful not to cut too deep, so you don’t mar the cement finish. 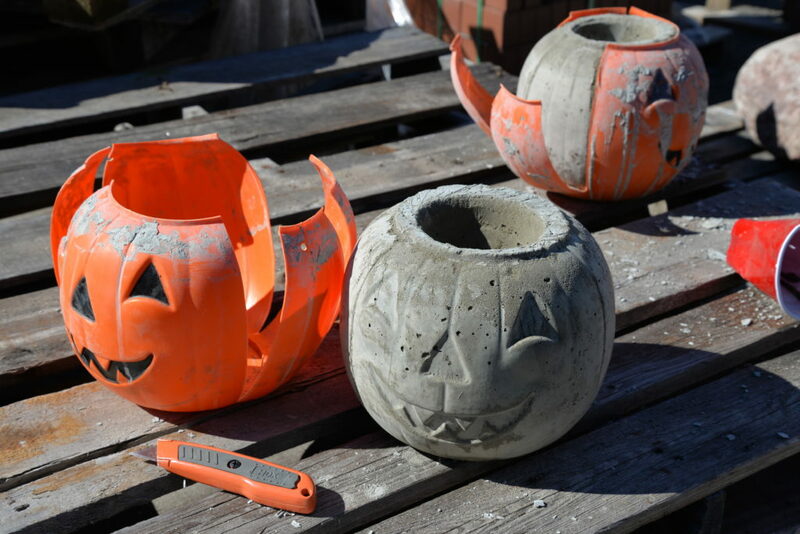 Let the exposed cement pumpkin cure a few more hours if it still appears damp, or whatever time is needed for your current climate. He’s ready to paint! Isn’t he so cute already? Brush on Bungalow 47™ Furniture Paint in your choice of color. We made a variety, but orange is the obvious classic choice! Grab a sanding block and distress as desired. Take special care to sand the top opening as to knock off any rough spots where you will be touching. 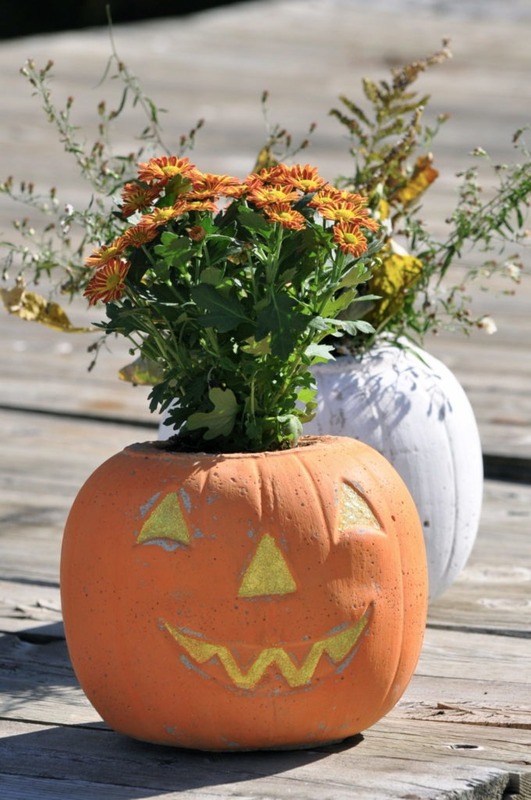 Now it’s time to style or fill your little work of cement art! 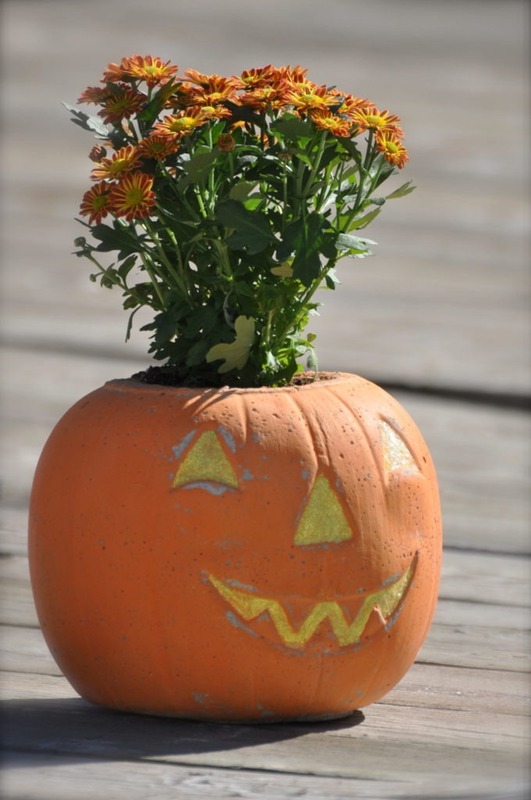 We used fresh flowers and pickings from the surrounding woods, but you can fill with candy, sand and a pillar candle, dried or silk flowers and leaves, or whatever your creative mind can think up! 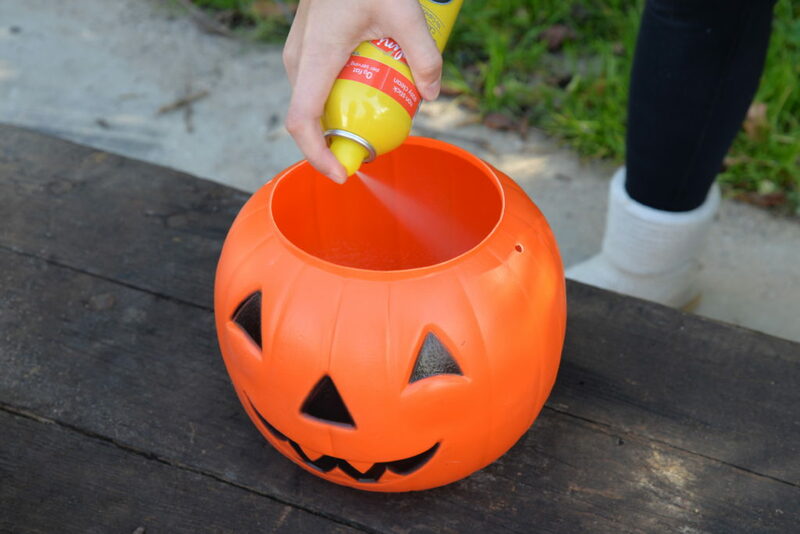 Now this pumpkin will last forever, and no one will try to kick it off your porch! 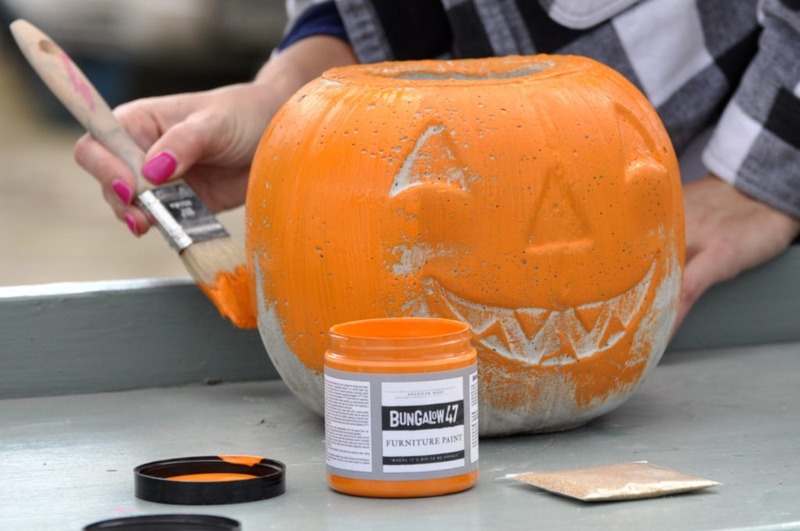 Stay tuned for more crafting and decorating fun using Bungalow 47™ Furniture Paint! We got this idea from a video we saw on You Tube. 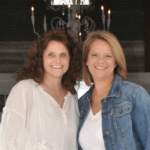 Get inspired and make it your own! This is gettin’ done at our house this year! For sure! How fun!!! !